Many years ago MoreBeer! worked with March Pumps to release what is now the standard pump in the homebrewing community, their model 809 (our H315) with a polysulfone head and 6' cord with plug. Thousands and thousands of these pumps have been sold to homebrewers. Now, with a slight design modification, the new model nearly eliminates past cavitation issues (where the impeller spins in an air pocket and no liquid moves). We've been testing/using the pump with our BrewSculptures for several years now and are extremely happy with the results, so much so that we are completely replacing the H315 with the high flow model. The new model comes with all the great features of the original - magnetic drive, handles flow restriction, okay for boiling temperatures, 6' cord with plug, food-grade materials in contact with the liquid, 1/2" ports, etc. - but now features a different slightly higher flow rate with less issues of cavitation. 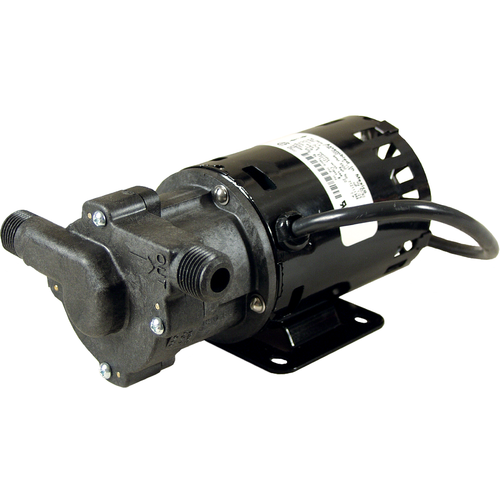 The magnetic drive in a March pump acts as a clutch allowing the user to put back pressure on the pump to slow down flow. Since it is magnetic drive, it is not self-priming, you must put the pump below the level of the liquid source. This pump cannot be run dry. To restrict flow place a ball valve on the out flow of this pump. This is the pump we install and use on all of our BrewSculpture brewing systems. We stock polysulfone replacement heads, H317, in case the threads are damaged. If you are looking for a pump for a larger home brewery or small nano brewery you can also look at our H325 Nano Brewery pump from March. 1/2" mpt fittings on both inlet and outlet. Will handle internal pressures to 50 psi. Face unscrews and rotates at 90 degree intervals to adjust to your application. Note: When using silicone tubing, we recommending using a slighlty larger barb than the I.D. of the tubing. This is because silicone tubing tends to have greater pliability than most tubing. For example, when using 1/2" silicone tubing, we recommend our 5/8" barb (H620), to help ensure a better seal! It matches the one I already have. Used them before and they are great! What is the head pressure rating for this pump? Could I transfer a 30 gallon batch? BEST ANSWER: I run three 11 gallon batches into a 40 gallon fermenter using this pump, and when I’m pushing the last gallon of beer into the 40 gallon fermenter I have 32 gallons of beer pushing back and I’ve never had a problem. I’d guess I could do even more if I had to. Not sure if that’s the answer you were looking for but I hope it helps. This pump is rated for 7.0 gpm at 18.6 ft. TDH. I don't have the pump curve, but unless you're pumping a long distance through small diameter tubing, the total head should be less that 18', so your pump rate would be higher. You shouldn't have a problem transferring a 30 gal. batch.. Check out March pumps website. Specs are there. I didn't see anything about a head pressure rating though. I would expect a 30 gal batch could be transferred with this pump. I have only transferred 13 gallons from kettle to conical and conical to kegs with no problems. These are great pumps. They work very well but you have to make sure that you have adequate liquid flow to the pump since it will not pull liquid through a dry hose. The plastic head is not a big deal for me since I have a valve and quick disconnects installed. It is tricky getting the valves threaded the first time so if you plan on screwing things on and off of the pump head, go for the steel head. I've had this pump for a few years and it's a great addition to my setup. Once you get a handle on priming the pump, it's a breeze. I have it connected to a counter flow chiller and it makes cooling the wort very quick,easy and safe. Definitely recommend. I have this pump and the 815 (non-high flow) and there is a huge difference. I never have to prime this pump, just open the valves and turn it one and it's pumping. I need to upgrade my impeller to the HF version at some point to make my old pump operate like this one. Never had any issue in over 3 years with this pump after dozens of batches. I do recommend buying some spare gaskets and nylon washers to have on had so you don't have stuck on a brew day. I love my March pump, and use it for recirculating my mash and cooling via my plate chiller. I opted to use stainless quick disconnects at all of my pump, valve, and hose connections which makes re-routing the pump a lot easier. Had this pump for about a dozen batches and never had any troubles, even with boiling wort. Be careful with the plastic threads and keep the fan covered, though. I have used this pump for two years without any issues. It's a solid workhorse pump that has been extremely reliable. I would definitely buy another. My back is happy with this work horse. I use two pumps on my single tier stand. They both do exactly what I need them to do, but I didn't care for the plastic heads. The threads were finicky and didn't inspire much in the way of confidence. Once I replaced them with steel, I was able to get the connection I want and now I'm off and running! how did I ever brew without a pump? I purchased two of these for my single tier brew stand. Both work without flaw. The only thing that could improve is if they came standard with stainless threads rather than plastic. I used this on my HERMS system and it works great. I've left them on when dry and they didn't burn out. They push beer through my home made counter flow chiller with no problems. If they broke I would probably replace them with the same ones. This pump is the best. I trade up from the chugged pump. It has less priming and cavitation problems. Well worth the extra money and made in U.S. too. Wouldn't want to be without it today. It is my workhorse for pumping liquid around the brewhouse. It is a must have! I have put my pump through many battles, and still going strong after 3 years. Minimal maintenance required. Great for moving liquids from container to container even at boiling temps. I bought a chugger and a march pump, the march is still my favorite one, I don't like the noise the march one makes! However, first or second time you remove the ball valve and the plastic threads are gone, replace with chugger stainless steel head asap. Great pump! This is a necessity for anybody looking to get into homebrewing. Saves precious time. One key point make sure you protect the back of the pump during your process so no wort or water is spilled on the fan. This is a fantastic pump for moving boiling to cooled wort. Sure makes brewing easier and a must for using a counterflow chiller. Great Pump, even better service! I bought two of these pumps and they are fantastic! However there's something more important to convey to you. One of the pumps had faulty threading on one of the 1/2" NPT fittings. I asked MoreBeer to send me a new pump head and just like that, the company ships me the part, no questions asked. I work in retail and MoreBeer's customer service and fast shipping is incredible. I have purchased a lot from this company and they never (not ever) disappoint me. Buy the pump for a quality product, buy from MoreBeer for the enhanced customer experience. Win/Win! This is a great pump for transferring beer around. I have one my system. It allows my back to be spared during a brewing session. A must have! I had this pump for about a year and a half and it failed on me. So I bought a new stainless steel one and have not had a problem with it yet. Plus I like the fact that it cleans easier. Peace of mind! This is a great product, but I couldn't give it 5 stars because of the quality of the plastic threads. Do yourself a favor and buy a steel head chugger pump instead. This is my second March pump and use and abuse them. They keep on working like day one. I purchased this second one to recirculate my HLT for my HERMS system to keep the water in the kettle at an equal temperature. Upgraded to an all-grain system and this made things so much easier. Never had any problem with these. They work great! Awesome pump, we use it for sparging. Easy to use, clean and repair. If you want a multipurpose pump, a perastaltic pump that accepts 1/2" silicone tubing would be better. That is our next upgrade, but it comes with a cost. I've used this pump for a dozen 10 gallon batches. Cuts down chilling time tremendously. I'm able to cool my wort down to 70F straight from the kettle. Having owned a 5 gallon sculpture - (B3-500) since 2003 that I have since upgraded and modified to a 10 gallon system, and 3, 12 gallon conical fermenters, my assistant brewer and I decided to start brewing 2 batches per session. We found that we would get in a bind with only 1 pump once the second batch was underway. Consequently a second pump was ordered. Both pumps have worked flawlessly since they were added to the system. More beer has been my primary source of equipment for over 10 years and will continue to be for years to come. I only wish it had an on and off switch. Other than that, I love it. Not too loud either. I've only used it once, but it seems like a very solid product. what else can i say, used this pump for recirc, step mash and chill, when i was done with all that used it to flush the system with sanitizer. all done, pack it up call it a day, do it again tomorrow. This is a great pump for transferring beer around. I actually have 2 on my system, one for sparging and the other for the mash. I use the same pump for the mash and boiled wort to cool it and transfer to the fermentor. I would give it 5 stars but I've had to replace the thrust bearings a few times, maybe I am using them too much, It is not a big deal because I am cleaning it anyways and they area cheap. I just bought the stainless steal housing to replace the plastic ones. I plan on machining off the NPT threads and laser weld (I have a bunch of laser welders at work) Tri-Clove fittings on because I am going to sanitary fittings for everything. This pump has been a convenient upgrade to my home brewery. It eliminates the need to lift heavy pots of water or wort. Also enables me to perform a post boil whirlpool. Runs great and easy to hook up and use. Much more quiet than expected. I did add a red sticker to mark outflow direction because the black plastic wording is hard to see. I can only say that I love having this pump incorporated into my brewing system. It's not only a time saver but it allows my back to be spared during a brewing session. Not having to lift full pots of extremely hot liquids has been a great bonus. A must have! Whether recirculating the mash or whirl-pooling after the boil, this is a great pump. Put a ball valve on the out of this pump to control the flow speed and it's the perfect brewing accessory. One of the best upgrades I've made to my system was adding this pump. I purchased this to install on my new 10 gal brew system. I have two pumps now and transferring wort is very simple now. This pump works like a charm. Just keep it primed. I would recommend this product for your system. I now love this pump after upgrading the impeller to high flow. Now have no problems with higher temp pumping during sparge. This is my first pump purchase and addition to my setup. I have it feeding my CF chiller and it is plenty powerful. I have a ball valve installed on the out to control the flow and it works great. If you have the budget, definitely get it and don't look back. Cheers! I have two of these pumps on my single tier system, and love them! The only thing I wish was different was the option to have a longer power cord. but it seems to be standard length. I had to cut mine off and splice a longer one on to make it all the way back to my control panel. But other than the aesthetics of that, I have not had a problem with either of them. I bought this pump to give me a little more head pressure when recirculating up to the mash tun on my More Beer tippy system. This pump and the tippy system do everything advertised and more. I love brewing 20 gallons and then splitting the batches with different yeasts or adding different adjuncts and producing not one, but four fantastic beers. I will be moving to 56 gallon kettles and the tippy system will be the pilot system in the soon to be Ozones Brewhouse!! Buy the pump for any set up. Buy the tippy for a killer system!!! I've loved having this pump, I went from gravity only. I've found that I need to disassemble it to clean it every batch though. I brew about once a month. I have a direct fired Mash-Tun where I use this pump to recirculate the mash to keep the temperature consistent. I don't have it temperature controlled, just good old manual calibration. I would definitely recommend the new kit that comes with the input and output valves and bleeder valve. I built one myself and it has helped tremendously in priming the pump and getting rid of the air bubbles for a trouble-free pump. My only complaint is that the plastic head is very sensitive. I ruined one of the threads the very first time I used it. Definitely use some teflon tape and be very gentle, or better yet buy the kit where everything is already assembled. I have been using this pump for about two years, and it functions flawlessly. The best single upgrade I have made and it completely eliminates the need to lift heavy pots of water or wort. My back really loves this upgrade. It also allows me to do things like recirculating the mash and/or whirlpool which really helps improve the clarity of the beer. I highly recommend this product. I have been using this pump for over a year.. I've done countless batches and this pump is up to the task. Occasionally the pump won't get enough wort and it will screech like a banshee!! But I unplug it, plug it back in and it picks up right where it left off. I bought the earlier version of this pump from B3. Just upgraded the impeller to have the functionality of the H315. Works wonderful and great to have the ability to throttle the flow. An extremely useful piece of equipment that is well worth the investment. I have been using this pump for over two years and have no issues with it. I have found it to be a great addition to the brewery that provides many improvements to the process on brew day. This pump improves the process by reducing the time it takes to brew, makes for cleaner wort by providing a good post boil whirlpool effect and also contributes to safety by eliminating the need to lift a kettle of hot liquid for transfer. It is a robust and extremely useful piece of equipment that is well worth the investment. I have 2 of these pumps and have never had an issue. Countless brews and still going strong. I love this pump. Hundreds of brews and it's still kicking.